Geoffrey and brother Tom were taught by their parents and had no formal education. But when the inspector came round every six months to test the children on reading, writing, and arithmetic, he found them to be very competent. Geoff’s “formal” education lasted through age 12, but his musical activities started much earlier (age 6) playing a tin-whistle. He quickly graduated to a simple piccolo, then flute and oboe, and Tom started to learn the clarinet. There was lots of time to practice with good supervision from Ernest! At age 10 he gave his first performance, The Mockingbird by Frank Brockett, during a family holiday in a small village called Kirk Michael on the Isle of Man. Upon hearing the performance, a family friend suggested that young Gilbert pursue the study of flute. Among the recordings on which Gilbert played are several pre-war LPO sets conducted by Sir Thomas Beecham including a series of Mozart symphonies recorded across several years beginning in 1934, and – with Beecham and the Royal Philharmonic – symphonies by Haydn and Schubert, Rimsky-Korsakov’s Scheherazade, Richard Strauss’s Ein Heldenleben, works by Delius, and many French pieces, including Debussy’s Prélude à l’après-midi d’un faune with its prominent opening flute solo. Vincent Needham, Jr., became Geoffrey’s first flute teacher in 1926. Needham, Jr., was an experienced orchestral player, and wrote and taught from a method handed down from his father, Vincent Needham, Sr. (1856-1916), who had played in the famous Hallé Orchestra before World War I. Additionally, Needham, Jr., was the regular flute player for a silent cinema, “The Plaza in Birkenhead (suburb of Liverpool),” and encouraged Gilbert to “read” with the cinema orchestra. Before long, Gilbert was offered a job in another cinema − the only problem: he was twelve and the musician’s union would not allow him to join until age 16. A recording of a rare work by Debussy, “Cortege” with principal flute, Geoffrey Gilbert playing the gorgeous solos. Gilbert joined the RPO and Sir Thomas Beecham in 1957 and remained with the orchestra until Beecham’s death. Albert Cunningham was Geoffrey’s next teacher who taught at the Liverpool College of Music where Gilbert had been awarded a scholarship. For the next couple of years Gilbert utilized his emerging talent in the entertainment field: amateur military bands (the David Lewis Military Band), amateur operatic societies, musicals, skating rinks, circuses, and an occasional cinema job. His talent was such that at age 14 the union made him an honorary member, allowing him to once again play in a cinema orchestra. Gilbert’s cinema job, coupled with a music scholarship, enabled him to pay tuition at Manchester’s Royal College of Music, where for three years he was under the tutelage of Joseph Lingard, Principal Flutist in the Hallé Orchestra. During this three year period of study, Gilbert’s memory was that all he worked on in lessons were grueling études − Anderson, Soussmann − and he played very few pieces (only Chaminade’s Concertino and Bach’s Musical Offering). Around 1929 he lost his cinema orchestra pay when the silent cinemas met their demise with the advent of “talking” pictures. 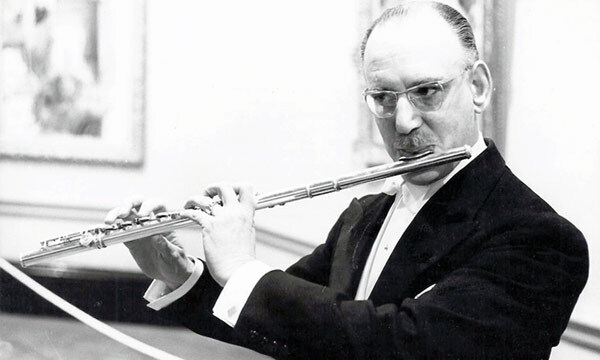 Between 1930 and 1969, Gilbert gained the reputation of being one of the most celebrated flutists in England. In 1969, Gilbert accepted a position as Director of Instrumental Studies at Stetson University in DeLand, Florida. Stetson had attempted to entice him several times, but when his wife, Marjorie, was offered a position teaching speech and drama, the two decided to settle in America. 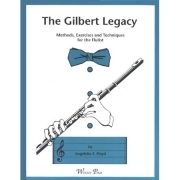 While living in the United States (1969 to 1989) and lecturing throughout the world, Geoffrey Winzer Gilbert achieved world-wide recognition and high acclaim as a teacher of American flutists.